THE KEY CONCEPT : In a closed mouth smile, by far the most important feature is the very outer section of the line between the lips which should angle sharply upwards. Figure 1: The laugh heard around the world. Barack Obama has a particularly demonstrative and wholehearted laugh. When he is especially amused, his lips are stretched to the maximum by the smiling muscle, exposing the dark gaps to the outside of the teeth. The broad smile always exceeds the width of the teeth, which curve much more sharply into the skull than is evident from the outside. The caricaturist has also focused on the eye squint and Obama's showy, projecting ears. In the case of the human face, artists who depict stylized faces, like those in cartoons or animated movies, can clarify the existing facial expression by exaggerating what’s important and suppressing what’s not. For example, President Barack Obama shows an enormous array of teeth when he laughs, and he squints his eyes hard. That’s clear in the clever caricature shown in Figure 1 and the press photograph in Figure 2. In the cartoon, it all looks right to us, because the artist correctly identified things that were special about Obama’s laugh (and facial proportions), and in pumping them up, he triggered our unconscious perception of the same thing. There are times that a good caricature of a face looks more like the person than a bad photograph. ​​However, it's a bit more difficult to draw a convincing smile with a closed mouth than one with the teeth clearly showing. The toothy grin is perhaps the most quickly recognized of all facial expressions as in Figure 4. There is no other expression with which it can be confused, with the bright white row of teeth displayed against the darkest skin on the entire body, that of the lips. It’s easy to stylize the open mouth smile shape and still have it read clearly; in earlier blogs I’ve illustrated some of the many shapes that will do the job. Figures 4 & 5: More subtle = more difficult. In on-line tests, we found it much more difficult to get high scores with closed mouth smiles than with open-mouth smiles. The broad smile has the great advantage of being a large, unmistakable bow shape, with showy upper teeth and and dark framing features in the mouth corners and the area below, when the jaw is dropped, as in Figure 4. There are fewer obvious signatures of the closed-mouth smile. One is the dimple in the mouth corner, as exaggerated by the clever Amazon smile logo (Figure. 6). But the dimple is not a strong trigger for recognizing a smile, if the line between the lips is too flat, as in Figure 5 where 36% of my testers mistook the stylized man's expression as "neutral.". Figure 6: Amazon gets the dimple right. When our research group at the University of Washington began testing smiles, we discovered that it was easier to get high scores with open-mouthed smiles than with those with closed mouths. It’s also true that less intense versions of any facial expression, such as fear or anger, tend to be more ambiguous and less easily recognized, but I began to suspect that there were certain, less-obvious features of the closed-mouth smile that might be critical towards recognition. Was it the width of the line between the lips, or the shape of its arc? Was it the narrowness of the stretched lip lining? Was it the dimple at the mouth corner, as in Amazon's version of a smile in Figure 6? Hiding in plain sight were two pieces of art that I had clipped and filed long ago, that I knew were particularly effective versions of the closed-mouth smile. One was a grinning Donald Duck; the other a line art illustration with a smile that ended in upraised corners in a practically right angle. Finally, I realized what had literally been staring me in the face – a key component of the closed-mouth smile is the up-tilted mouth corner. It’s such an important component that it can render a smile recognizable and convincing even if the other 85% of the lip line is straight. That’s what both Donald and the geeky guy with glasses have in common; Donald’s beak is inflexible except for the outer corners, and that’s all the Disney artists needed to show him happy. Figures 9, 10 & 11: Once I realized the critical importance of the mouth corner, I ran some simple online tests to try it out. The lips in Figures 9 & 10 are identical except for the upward curl in the mouth corners in Figure 10, and the 46% bump in the joy score is about as strong an improvement as it's possible to get with such a tiny modification. It was the cartoonists and animators who gave me the clues I needed to pinpoint this super-useful smile detail. Simply driving an animated face with motion capture does not provide such insights. For a stylization like this to work, it has to trigger our recognition of some actual, anatomical feature. 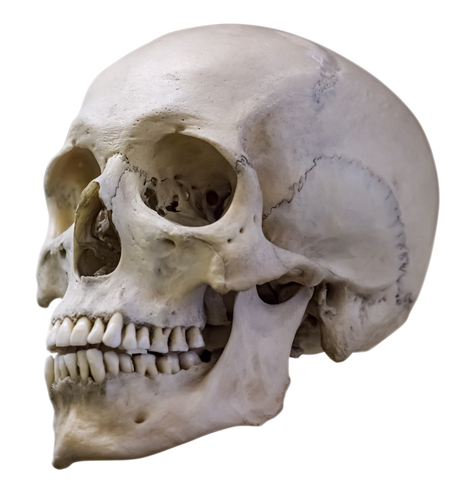 In the case of the tilted mouth corner, the anatomy at work has to do with the peculiar relationship between the mouth and the teeth. It turns out that the teeth are arrayed on the jaw so that they curve back into the face well short of the mouth corner when the lips are stretched in a smile. This is evident in the wide-mouth smile at the upper corners of the mouth (see the detail in Figures 1 & 2); in the closed-mouth smile, it’s apparent in an abrupt change in angle, at the point where the lips break free of the teeth, whose surface they have been clinging to, and suddenly angle upwards towards the cheekbone. Figure 12: The anatomy behind the effect. The relaxed mouth clings to the teeth below. When we smile, using the zygomatic major muscle (depicted in red), the lips are pulled back towards the ear, but their upwards rise is limited by their pressing against the teeth. Once the smile surpasses the teeth in width (far right), the angle of the line between the lips pivots upwards (the pivot point is indicated by the arrow and change in lip color), and this change in angle is always visible in the true (strong muscle action) closed-mouth smile. ​The good news is that artists have been very busy, for quite some time, discovering fine points of facial expression that their artwork brings to extra-vivid life, and it’s the job of this blog to describe and illustrate as many examples as I can find. Credits: Figure 1: Caricature of President Obama, cartoonist unknown, found here; Figure 2: Photo of President Obama from 2013 White House Correspondent's Dinner, published in the Baltimore Sun, found here; ​Figure 3: Photo of Joseph Gordon-Levitt found here; Figures 4, 5, 9, 10 & 11: Group-sourced facial expression "tests" with response graph and illustrations by author; Figure 6: Amazon "smile" designed by Turner Duckworth; stock photo found here; ​ Figure 7: Donald Duck, cartoon character created in 1934 at Walt Disney Productions, image found here; Figure 8: Stock illustration of "geek" found here; Figure 12: Stock photo of skull found here, colored lines added by author.